I read this book as a teenager, and I've been trying to find it for a while. When the story begins, it seems like a fantasy book, since there are Stone-Age era humans hunting fantastic animals. It's pretty soon revealed that the other species are actually sentient, but they have no way to grow plants, so they hunt and kill other species to eat them. There are mentions of flying orbs floating through the sky, which are vehicles driven by humans that seem futuristic. One crashes, and the woman inside implies that the the story takes place in a dome, which acts as a prison, and maybe a reality show. I can't quite remember. She also says that the ancestors of all the humans in the story were placed in the dome for some unspecified crime. Eventually, I think the main character and the woman are exiled or have to flee the human village, and the story ends as they reach the side of the dome and go through a door there. The protagonist's brother becomes the leader of the village near the start of the story. The leader is whoever can bring back the most food from a single hunt, and the brother ends up fishing in the canals around the village for the crab-things that live there. The different species sometimes trade the sick and elderly members of their species for the sick and elderly of both species, so that they can both eat. The protagonist gets hurt somehow, and assumes that this will happen to him, but his mother sacrifices herself instead. The different species included some kind of pterodactyl things, and some things with long tongues, and some kind of (spidery?) things that were able to make zombies or something out of other species. At one point, a new species is teleported into the village of a species that had gone extinct. It's mentioned that this usually means that the new species will be easy to kill, but the new species is actually very deadly. I think they are the things with the long tongues. I think the buildings in the villages are made from some kind of adobe, but I may be wrong. All of the buildings are from when the dome was made, and the humans don't have the knowledge to make new ones. Initially, the woman from the flying orb refuses to eat, since all of the food they have is meat from sentient creatures. It's also implied that she's abused by the protagonist's brother. It bothers me that I remember so much about this book, but not the name. Circa 2008, when I read it, it had no wikipedia page. I think the cover was a vertical sword against a textured brown background, but I may be confusing it with something else. I spent the past hour searching for it. 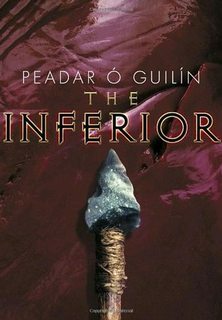 It's called The Inferior and is actually part of a trilogy, "The Bone World Trilogy". I'll have to get around to reading the other two eventually. The protagonist is called "Stopmouth" because of his stutter. As you can see, the book cover has an arrow across a brownish-red cover, similar to your description. The Wikipedia summary covers many of your points. Wallbreaker - Stopmouth's brother. He is very observant, and prefers to hunt methodically using traps rather than using sheer force. By using his cunning intellect, he becomes Chief after Speareye's untimely death. .... the humans hunt other species and "trade flesh", a tradition that has the humans trade the weakest and most useless members of their tribe to other species as a source of food. In the book, this is known as "volunteering", and it is considered shameful to attempt to resist being volunteered for the good of your tribe. It's pretty soon revealed that the other species are actually sentient, but they have no way to grow plants, so they hunt and kill other species to eat them. There is a vast variety of different species of sentient creatures, all of whom either have made alliances with the humans, or hunt them as a source of food. There are mentions of flying orbs floating through the sky, which are vehicles driven by humans that seem futuristic. One day Stopmouth meets a woman named Indrani. Indrani fell from the sky when one of the mysterious globes that fly across the 'Roof' (the Human tribe's name for the sky, basically) explodes, and she is expelled from it. One crashes, and the woman inside implies that the the story takes place in a dome, which acts as a prison, and maybe a reality show. Indrani reveals toward the end of the book that she comes from a tribe of Humans who live in the Roof, and actually watch the Humans below fight for their lives as a form of entertainment.